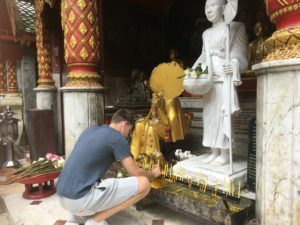 With a ‘Sawadee ka’ and a Wai, (a slight bow with palms pressed together) I prime my son Mark for his first visit to Thailand. 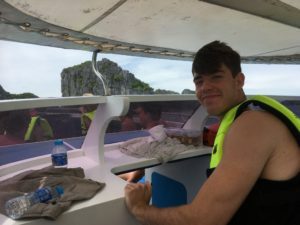 He stands at 6’4′ tall, a giant in comparison to the smiling dark haired locals, eyes wide he’s ready to embrace his first Asian experience. 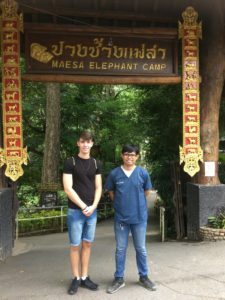 Stepping out onto the streets of Chiang Mai, we are swaddled in the relaxed university vibe that can best be described as the Thai equivalent of Galway. 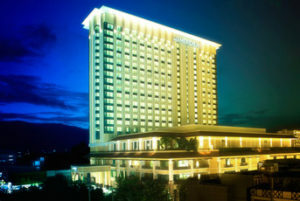 Our hotel, Le Meridien, is one of the few high-rise stretching up between the thousand year old temples and beauty parlours. The medieval moat marks a square boundary running beside the old city walls and the uniform streets provide calmness in stark contrast to the capital Bangkok. This ancient city is a short one-hour flight north from the Thai capital and is often overlooked by those rushing to get to the beach and many islands in the south. In the far distance lush green hills beckon as we are picked up by bus to take us to The Maesa Elephant Camp at Mae Rim. 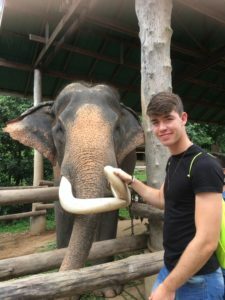 Elephants have always been an integral part of the Asian landscape but since logging was banned in 1989 the general population has fallen to circa 3000 wild animals and the future for these creatures is considered by many to be in tourism. I’m keen to observe the way the elephants are cared for and surprised to learn that each has a personal mahout that according to the camp’s vet Siripat, “See more of their elephant than their families.” Siripat is one of a small number of graduates each year from university to specialise in elephant health and he guides us through the quarters where the older elephants are kept. Mark and I pummel turmeric and ginseng and other strange roots into a pungent mixture before delivering it to the geriatric elephants, and although the smell is atrocious, there’s a sense of satisfaction as they take their medicine from us with their beautifully decorated trunks. The skin of the Asian elephant is a delicate pink around the eyes and top half of the trunk and the ears are smaller than the African variety and carry torn edges. The nursery is an equal hive of activity as new recruits line up to take their first art lesson. 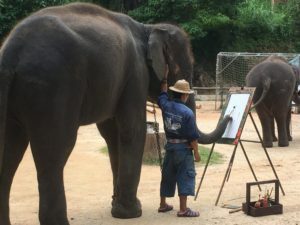 Incredible as it may seem this camp has a resident artist that teaches the elephants and mahouts to paint a variety of images. 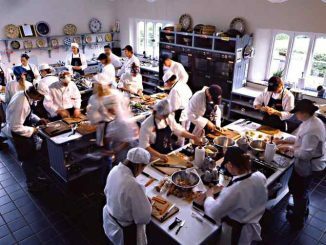 Some works reach thousands of dollars and have made the Guinness Book of Records. 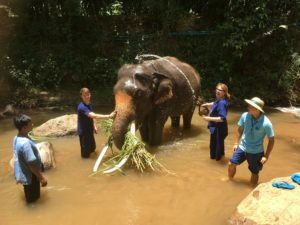 Each night the animals are released into the jungle but always return next morning to their mahout. Mark and I give a bull a good wash in the river − he seems to think we need a wash too and sprays us down. But it’s not a problem as we wear a uniform so our clothes are intact in the changing room. We’ve worked up a hunger and in general street food in Thailand is good and extremely cheap. 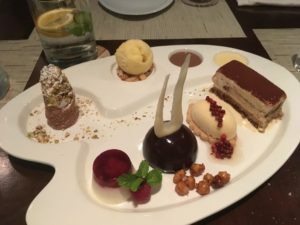 But after a full day at The Elephant Camp we decide to try out the restaurant at Le Meridien. The manager Gregory is Australian and has been living in Chiang Mai for many years and has brought a boutique feel to the hotel’s brand. “Our choclatier makes all our chocolates by hand.” She paints them to resemble local fruits and they are the perfect petite fours to our delicious meal. Back in our room I’ve a clear view of the second most important temple in Thailand, Wat Phra That Doi Suthep perched high in the mountains − the gold steeples glitter, even from such a distance. I enjoy it while sitting in the large-square-bath in our en-suite which in fairness would fit Mark’s rugby team. 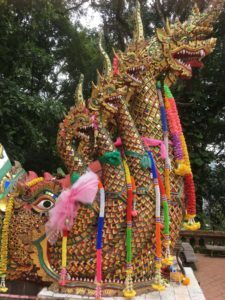 Next morning I take him for some contemplation to Wat Doi Suthep, about twenty minutes from the city and serviced by monks who bless us and give us bracelet blessings for 20 Baht, about 30 cents. 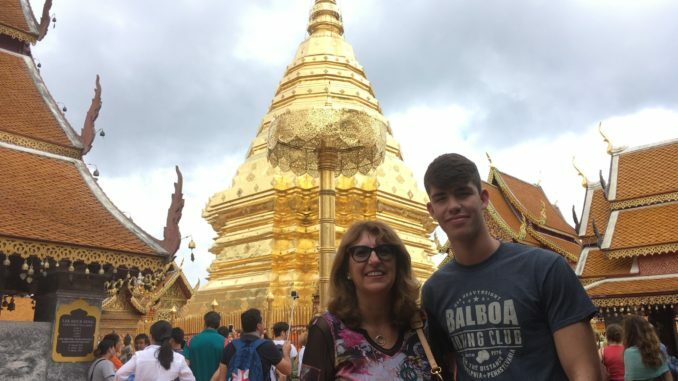 There’s plenty to do, from buying a tile to help pay for a new roof at the temple or burn some incense but we are fascinated by the thousand-year-old paintings on the walls that tell the allegory of the Buddha; Inspirational stuff for my sixteen-year-old indeed. 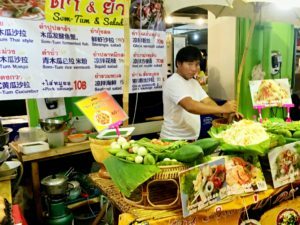 At night Chiang Mai has a special buzz in the markets and food is at the forefront. 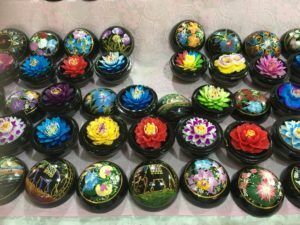 Delicately carved soaps are on display and sold in hand painted cases. Bustling stalls sell sound systems, T-shirts and more food − Mark picks up a wireless speaker for €30 that still works after our arrival home. Electronic accessories are probably the best deals. 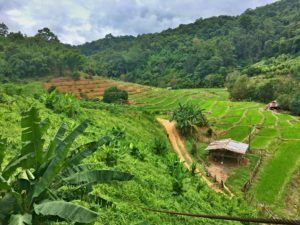 The jungles of Northern Thailand are a photographer’s delight with tiered paddy fields and rope bridges stretching between the high branches of the tamarind trees. 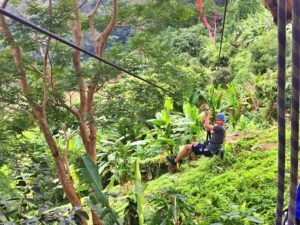 I’m especially safety conscious while travelling with my boy so chose Eagle Trek Zipline, as they provide the only double chorded zipline in the area. It certainly makes me feel more secure as we buckle up and put on our helmets. The silver tour takes us through 16 zips, some short and others 200m long, as well as several rope bridges. It’s a two hour hike and great activity to share with a teen, who enjoys laughing at my clumsy landings and yelps as we abseil up and down the trees. 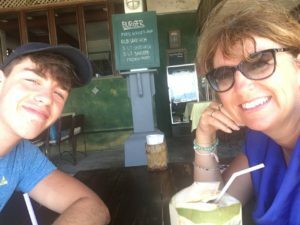 We are served a selection of Thai food back at the base camp and although we’ve put in most of the day I’ve still time for a spot of sunbathing on the rooftop pool of our hotel, while my son works out in the gym. We even have time for a quick massage before dinner and at 300bht (about €8) I’m not complaining. 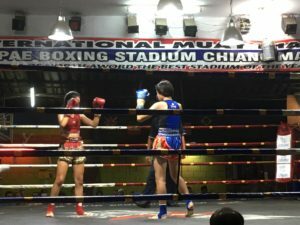 Thai Boxing is hugely popular in Thailand and a reasonably priced night time activity. 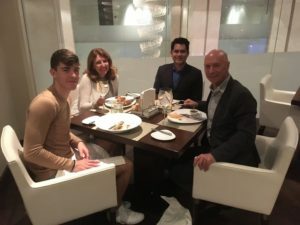 Although it may seem more brutal than western boxing it’s more gracious than MMA and just as skilful, I didn’t want to go at first but found I got really into it − to my son’s surprise. 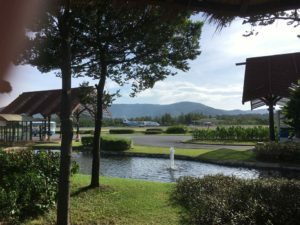 Three nights is perfect to relish the flavour of Chiang Mai but we are off next to Koh Samui flying with Bangkok airways; voted best in Asia for several years and offering free snacks, wifi and beverages for all economy travellers in Thai airport lounges. 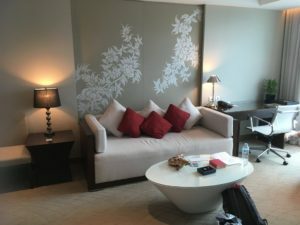 The arrivals area at Koh Samui resembles a 4 star hotel lounge, with rattan furniture and decorated ponds welcoming visitors to a place of calm and wellness. 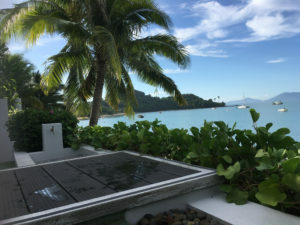 Some of Thailand’s most luxurious wellness retreats and temples like Big Buddha make Koh Samui the perfect destination for those seeking Zen. The legend of the mummified monk fascinates us and he is worth going to see. 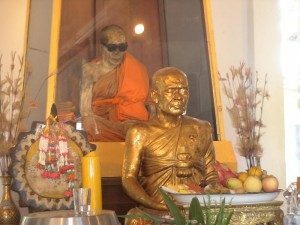 Perfectly preserved, he sits in the position in which he died in 1973 at the temple Wat Khunaram in the south of the island and sports a new pair of sunglasses each year to hide his eye sockets. We check into Celes Resort, a new luxury property on Bophut Beach and it feels like Carlsberg created this hotel. Situated on the north of the island, this stretch of golden sand is nestled around the bustling Fishermans village. 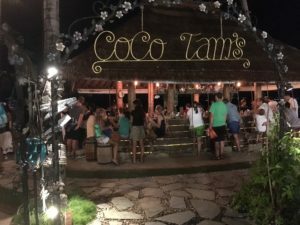 It takes about 15 minutes each evening for us to walk along the shore to the village and enjoy dinner in one of the many restaurants. I love this ritual as we close the gate on our villa and stroll to the action. 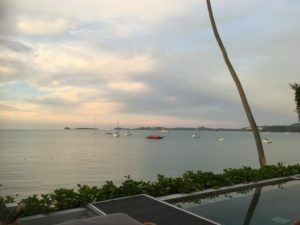 Our villa has a private pool and view onto the beach looking across at Pngnang Island; but there’s no full moon party for us. 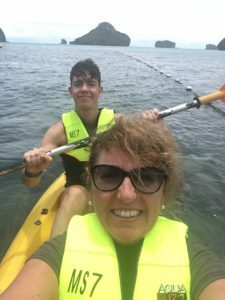 We are up early next morning to explore the Ang Thong National Park − a cluster of over 42 islands providing some of the best snorkelling in Thailand. We take a kayak to a private cove, feeling like characters in Alex Garland’s novel, The Beach. The day is filled island hoping and we are dropped back to our villa gate by speed boat in James Bond style. Bophut has plenty of massage parlours right on the beach and food is excellent and really cheap. But the best way to finish the evening is with a cold beer sitting on a bean bag at Coco Tams. This bar puts on a fire show most nights and always popular so it’s good to get there early. Watching grains of sand flashing like Catherine wheels to the smell of paraffin and excitement of the crowd is just one of a host of wonderful memories that will stay with me as the winter nights draw in. Even though Mark will probably be back here with his pals in the future I’ve had the pleasure of introducing him to the land of smiles, a souvenir that will last a lifetime. 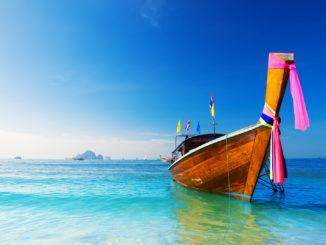 To organise a personal itinerary to incorporate your chosen aspects of a holiday to Thailand call Topflight 01 240 1788 or visit www.topflight.ie to see further details on the various holiday options that Topflight offer to Thailand.